First floor of Clocktower Building on Main St. Conveniently located next to CVS parking lot. 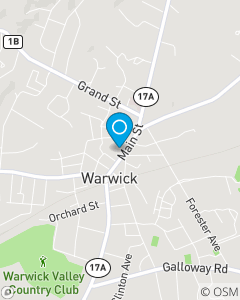 WILLIAMS INS & FIN SVCS State Farm Insurance office in Warwick provides our State Farm customers with great value on auto insurance, motorcycle insurance, home insurance, renters insurance, boatowner insurance, life insurance, health insurance and more. Prepare for the future with life insurance and financial services. We serve customers with insurance in Warwick, Orange County, and the rest of the Hudson Valley. Licensed in NY & NJ, Associate Degree in Social Services, State Farm experience since 1992, Notary Public. Warwick resident since 2004. Here to help you and your family stay protected when life gets rough.